New mint packets being sold by The Hershey Co. look nearly identical to the tiny heat-sealed bags used to sell illegal powdered drugs like crack, heroin and cocaine and glorify the drug trade, a Philadelphia police official said. 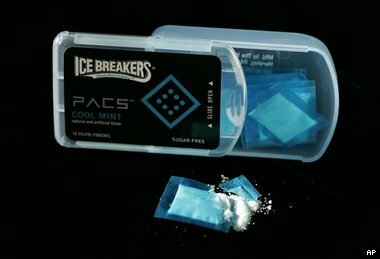 Ice Breakers Pacs, nickel-sized dissolvable pouches with a powdered sweetener inside, hit store shelves in November. The packets, which come in blue and orange plastic slide-up cases, are similar enough to drug packets that a child familiar with the candy could mistakenly swallow a heat-sealed bag of drugs, Philadelphia Police Chief Inspector William Blackburn said. "It glorifies the drug trade," he said. "There's really no reason that a product like this should be on the shelf." thats wats up ican fack like they drugs and make some money! and trick the cops? Quickly I need to know where I can buy some of this stuff, I need a "FIX" of candy RIGHT NOW! Please hurry my body is craving sugar right now. HELP! "Hershey Candy Made to Look Like Drugs"